The Twinners Reviews & Giveaways: Chutes & Ladders giveaway winner! 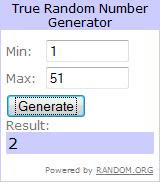 Chutes & Ladders giveaway winner! Big congrats to Rena, comment #2, on winning the Chutes & Ladders giveaway! Please make sure to reply to my email within 48 hours so I can send the game out to you. Enjoy!!! Thank you! I sent you an email!